Extensive tooth loss can interfere with eating and speaking and make you look much older than you feel. Dr. Teddi Olszewski can provide fully customized traditional and implant-supported dentures to restore oral function and rejuvenate your appearance. Ready to learn more about your options? Traditional dentures are removable. A full denture will replace your entire dental arch, while a partial denture will replace several consecutive missing teeth. Both types of restorations have a plastic base that rests on the gums. Dr. Olszewski will take impressions of your teeth and gums to ensure a proper fit. She and our partner lab will choose a color of plastic that matches the color of your gum tissue. A partial denture has small metal clasps that will keep it connected to adjacent teeth. Your dentist and lab technicians will work carefully to make sure that the clips are discreet. The replacement teeth themselves will have a realistic color and translucency. Dr. Olszewski proudly offers implant-supported dentures, which provide numerous health and aesthetic benefits. With experience in all aspects of implant treatment, she will set the dental implants in your jaw during a carefully planned surgery. Your bone will heal around the implants so that they become a fixed and permanent part of your jaw. When you have healed, Dr. Olszewski will attach your denture to the implant posts. Like our traditional dentures, implant-supported restorations are carefully crafted to match your teeth and gums. Implant-supported dentures offer several important benefits. First, the denture will not slip out of place, meaning you can chew, speak, and smile with complete confidence. Second, the implants can prevent jawbone recession. 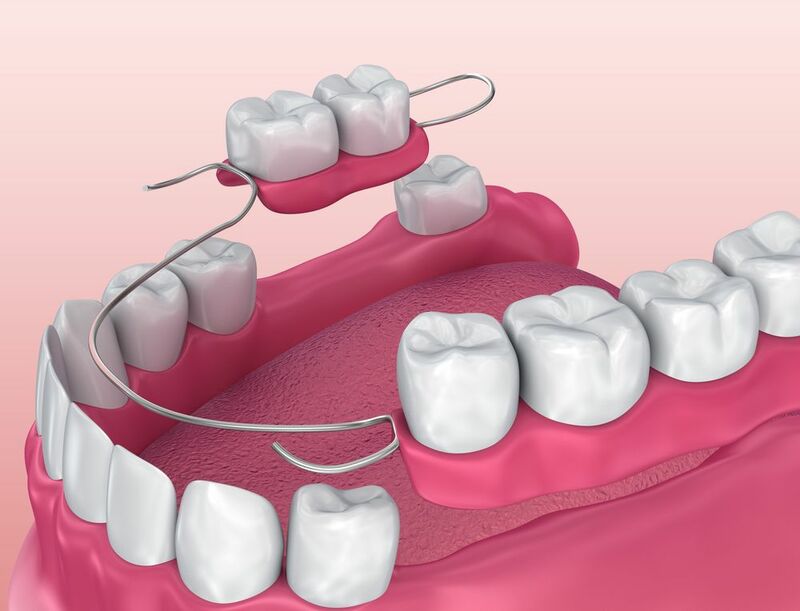 Removable dentures frequently require refinements as the jaw shrinks and changes shape. Implant dentures, on the other hand, rarely need any refinements since the implants prevent jaw atrophy. To determine the most appropriate type of denture for you, Dr. Olszewski will carefully examine your jawbone structure. If you have suffered bone recession, you may not have a strong enough base for implants. Dr. Olszewski may recommend a bone graft to restore a proper foundation for your implants. If you are watching your budget, or if you have a health condition that may preclude you from implants, removable dentures can be an effective choice. In either case, you can depend on Dr. Olszewski to provide a beautifully lifelike restoration that complements your overall facial structure. If you are suffering with a compromised smile, Dr. Olszewski is here to help restore your health and confidence. Contact our office to learn more about how our dentures can improve your quality of life. We can also give you some helpful tips for caring for your dentures to make the restoration last longer.